Varanasi, also known as Benares, Banaras, Kashi, "The City of Light" is one of the oldest living cities in the world. It is one of the most sacred places both for Hindus and Buddhists. Ashok Khanna says "I believe that Banaras is a heaven for photographers and that even if thousands of them photograph the city for thousands of years, they will always find new dimensions in it". 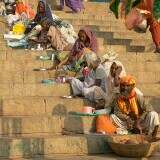 Thousands of people each year visit the Ghats - steps on the banks of the Ganges - to bathe in the sacred waters.